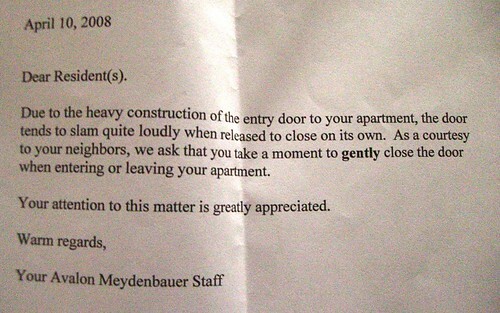 Apparantly letting the big-front-door fall closed on its own weight can annoy other residents. My fiesty Swedish flatmate is outraged by recieving the message below and the nature of its delivery, pushed under said heavy door. This scribble was published on Monday, April 14th, 2008. You can follow any banter on this scribble with the RSS 2.0 feed. You can share your inspired musings after typing the anti spam word near the bottom of the page. But no Pinging because its too naughty. I notice your anti-spam words are hard on old men. Mine this time was geezer. Maybe small rubber bumpers such as provided for the bottom of electronic equipment would be the solution. I wanted to comment on hockey but apparently your forum only takes one comment per subject anymore.